A site of approximately 125 acres is located by the regional road leading to Maadi suburbs, directly overlooks the Nile front on its east, and comprises a stretch of agricultural land interspersed by residential towers and encroached upon by informal neighbourhood on its western edge. 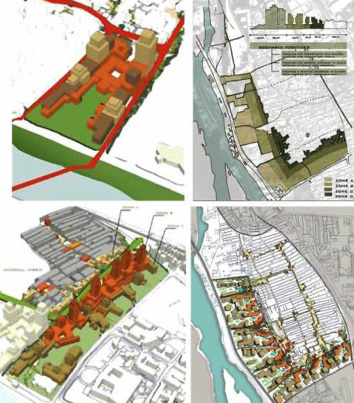 The planning mandate was to develop an urban design scheme that would capitalize of the land value – one of the highest in Cairo – While engaging the informal neighbourhood of Dar Al-Salam (219 acres) within a mutual development framework. At a later stage of the project, the area of the old river port of Athar Al-Nabi (80 acres) was added to the development framework, while the two islands facing the site Al-Dahab Major and Minor (418 acres) were also requested to be incorporated within a broader vision of a city hub.